Amateur astronomer Nick James of Chelmsford, Essex, England, captured an image of Asteroid 2011 GP59 on the night of April 11, 2011. At the time, the asteroid was approximately 2,081,000 miles (3,356,000 kilometers) from Earth. A small asteroid zooming by Earth this week has been caught "winking" as it spins in a new video recorded by an amateur astronomer. The asteroid 2011 GP59 appears to blink on and off once every four minutes because of its fast rotation, NASA scientists said. The asteroid will make its closest approach to Earth on Friday (April 15) when it passes just outside the orbit of the moon, they added. "Usually, when we see an asteroid strobe on and off like that, it means that the body is elongated and we are viewing it broadside along its long axis first, and then on its narrow end as it rotates," Don Yeomans, manager of NASA's Near-Earth Object Program Office at the Jet Propulsion Laboratory in Pasadena, Calif., said in a statement. "GP59 is approximately 50 meters [240 feet] long, and we think its period of rotation is about 7 1/2 minutes. This makes the object's brightness change every four minutes or so." On Friday at 3:09 p.m. EDT (1909 GMT), when the asteroid makes its closest approach to Earth, it will zoom by at a range of 331,000 miles (533,000 kilometers) – just outside the moon's orbit. The average distance between the Earth and the moon is about 238,000 miles (382,900 km). James is not the only amateur astronomer to aim a telescope at the spinning space rock. 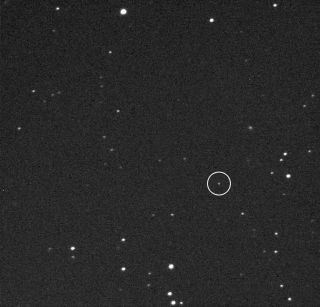 NASA officials said many skywatchers have been snapping photos and videos of asteroid 2011 GP59 as it nears Earth and posting them online for all to see. Despite the asteroid's near-Earth approach, the space rock poses no risk to our planet. NASA scientists and other astronomers regularly keep watch for any near-Earth objects, like asteroids and comets, which may pose a potential impact hazard to the planet. "Although newly discovered, the near-term orbital location of asteroid 2011 GP59 can be accurately plotted," said Yeomans. "There is no possibility of the small space rock entering Earth's atmosphere during this pass or for the foreseeable future."